IAA was formed in 1997 by Richard B. Ryon Insurance working directly with it’s strategic partner, Strategic Insurance Agency Alliance (SIAA). 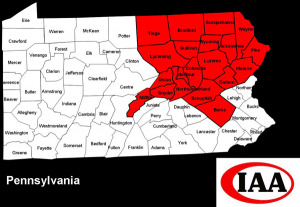 Our mission is to establish a network of independent insurance agencies throughout northeastern Pennsylvania in alliance with entrepreneurial spirited individuals..
Richard F. Ryon, Chief Executive Officer of Insurance Agency Alliance, Inc. and majority partner of Richard B. Ryon (RBR) Insurance where he handles the company’s 25 largest commercial clients. He has held his C.I.C. designation for over twenty-five years and possesses a vast knowledge of all aspects of the insurance industry. He also owns a Century 21 Real Estate franchise and has been involved in the creation of two banks. He earned a bachelor's degree from Babson College in Business Administration in 1972. He and his wife Cathy maintain residences in Pottsville, PA and Key Largo, FL. Richard (Rich) F. Ryon, Jr., is President of Insurance Agency Alliance, Inc. and partner of Richard B. Ryon Insurance. He is responsible for the overall management of the alliance and also the internal operations of the retail agency. Rich’s extensive experience in both personal and commercial insurance enables him to find the best solution in any situation. His ability to mentor new members has proven invaluable to IAA. He holds the C.I.C. designation and earned a Bachelor's Degree in Business Administration from The University of Vermont in 1999. Rich resides in Pottsville, PA with his wife and two children. Ed joined Insurance Agency Alliance in 2006. Over the last 3 years, he has worked to recruit independent insurance agents throughout the territory as members of the alliance. He is the liaison to both the current members and the insurance carriers. Ed is responsible for all IAA marketing strategies and various other aspects of the overall management of the Master Agency. As a former agent, Ed has significant experience working with clients in both the personal and commercial insurance sectors. Prior to joining Insurance Agency Alliance, he was the National Sales Manager for SDNP, a company that supplies online print and promotional products to Fortune 500 companies. Ed lives in Schuylkill Haven, PA with his wife and two children.